This helped prompt it to introduce a new start screen, initially dubbed "Metro", containing resizable tiles that could be tapped and swiped to launch and navigate apps. Users can still switch to a more traditional desktop mode by clicking on an icon, but the environment lacks the start menu button offered since Windows 95. "The broader issue is that Microsoft is building an operating system designed with a touchscreen in mind. That's essential for its future because computing is shifting to tablets and mobile, where Microsoft has been irrelevant." 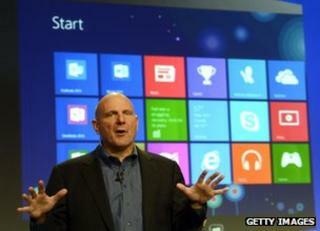 Windows 8 update: Microsoft crisis or business as usual?